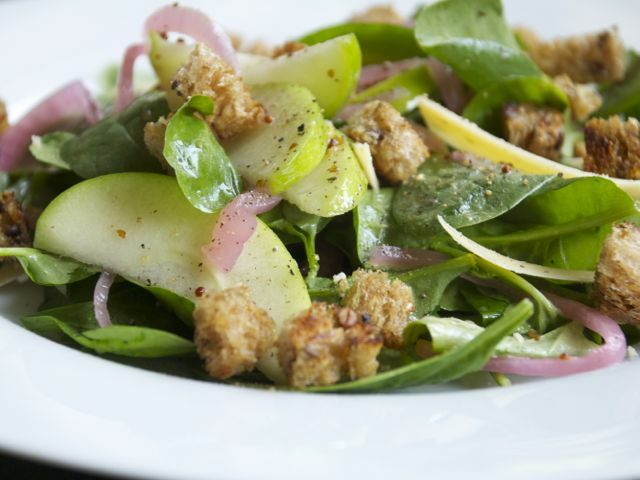 Last summer I had a delicious salad with rye croutons and green apples at C-House in Chicago. Here's my variation, which pairs nicely with White Winter Soup for a simple supper. Make the croutons: Heat the olive oil in a large skillet. Add the cubes of bread and a big pinch of salt. Cook over medium-high heat, stirring often, until crispy and toasty brown. Remove the croutons from the skillet and set aside to cool. Make the vinaigrette: In a small bowl, whisk together the mustard, vinegar, lemon juice, and honey. Slowly add the oil, whisking continuously, until the vinaigrette is emulsified and all the oil is added. Season to taste with salt and pepper.